The WordPress.com stats helpers have produced an annual report for BrokenTelephone. It shows that it was viewed about 41,000 times in 2013. If it were a concert at Sydney Opera House, it would take about 15 sold-out performances for that many people to see it. So, BrokenTelephone is small but perfectly formed, judging from the people who subscribe and comment regularly, to whom BrokenTelephone owes whatever relevance it has. Thank you all for reading, your comments, your suggestions and your support. I would like to single out Somerset, the nom de plume of retired BT engineer Peter Barrington. He is by far (219 times) the most frequent commenter, more than three times the next most frequent correspondent. He has irritated many BrokenTelephone readers but I have resisted calls to ban him, and I would like to explain why. Primarily I believe Somerset has a right to express his views. That they are so one-sided tells you that he is not impartial. He doesn’t have to be. As he operates in social media spaces, he is less constrained than BT’s official spokesmen. For all I know, he believes this is the best way of protecting his BT pension. BrokenTelephone is not the only online forum to attract Somerset’s contributions (is there only one Somerset? ), nor indeed does BT’s propaganda depend solely on Somerset. Other BT officials have also taken advantage of the quasi-anonymity afforded by social media conventions. Bill Murphy, who is in charge of BT’s next generation roll-out, has found plenty of time to push the BT line on Twitter under the Bill Broadband handle from the nominally impartial @WatchingtheFlow position. New_Londoner is another frequent contributor on Twitter and other forums. This is believed to be the handle of Openreach CEO Liv Garfield, who is leaving BT for Severn Water after Gavin Patterson was picked as group CEO. Another well-informed and highly paid contributor is BT’s chief network architect Neil McCrae, who at least writes under his own name, and about more than next generation broadband. Very often they have spotted inaccuracies in reports or questioned tenuous lines of argument. That is good, because it has led to greater rigour. It has also opened up new avenues of investigation, which have often shed more light on what are often complex issues. That said, BT’s use of social media is designed to instill fear, uncertainty and doubt in alternative proposals for rural and indeed national broadband access. There is without doubt an argument for doing things the way BT wants them done. BT’s social media correspondents have chosen neither to make it nor to win it on its merits. Instead they have tried, in disguise, to undermine the credibility those who propose alternatives or question BT’s plans. That suggests that their argument may be threadbare at best. BT’s refusal to reveal its planning assumptions on rural roll-outs suggests that it indeed has something to hide, and that its “competitive intelligence” argument is a fig leaf. This would be less important if there was a better balance in the sector. Instead we have Gulliver in Lilliput, thanks to Openreach’s near monopoly over last mile access outside towns, and the common insistence that a broadband account requires a parallel phone service. There are new faces at BT and at Virgin Media, and Vodafone is, or soon will be, flush with cash. Will this lead to fresh thinking? The hope for 2014 is that BT’s competitors – mainly Virgin Media, Sky, TalkTalk and Vodafone – can, possibly together, create a platform that offers real national competition to BT at local access level. Despite the dangers of duopoly, that is the surest way to extract better performance from BT. Everything of the best for 2014. 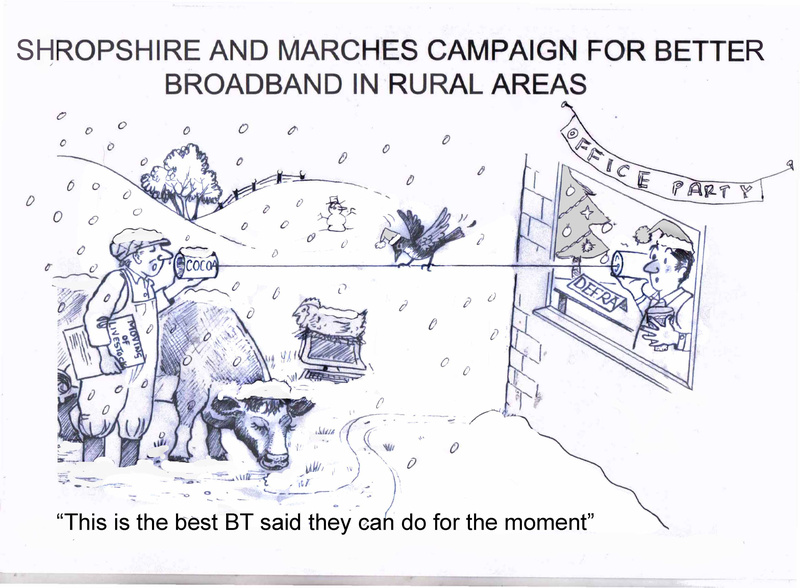 BrokenTelephone would like to add its congratulations to Alan Tippett of Knucklas, winner of the Shropshire and Marches Christmas caption contest in aid of better rural broadband. Best wishes to all BrokenTelephone readers. We hope the festive season is still among you and that you have lots of things to celebrate throughout the new year. 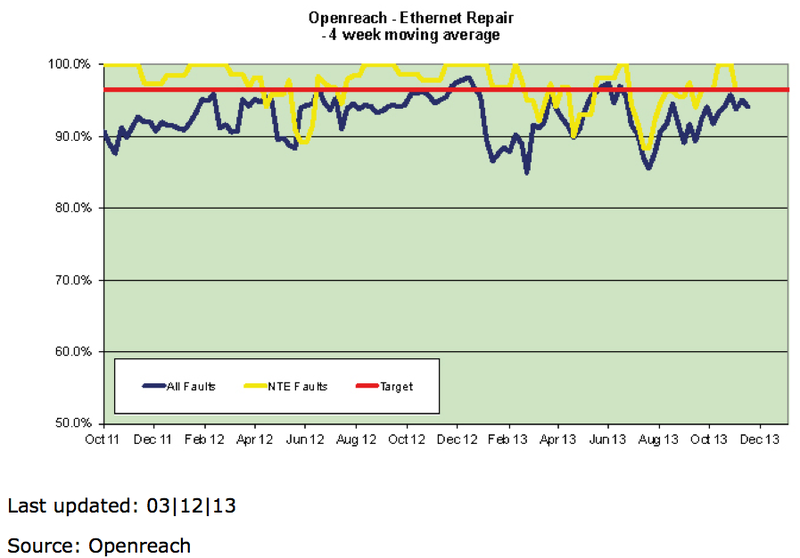 As these graphs show, Openreach, BT’s in-house communications infrastructure provider, has for the past two years consistently failed to meet targets to provide and repair services. Regulator Ofcom reacted this week by announcing that Openreach,which has an effective monopoly over last mile fixed access, has agreed new targets for service, and may pay fines if it misses deadlines. The news will be welcomed by communications providers (CPs), but the terms are not onerous. The deal comes into full force only from April 2016, by which time Openreach should have largely finished providing fibre to its street cabinets to handle GPON for next generation broadband. The new targets cover “wholesale line rental” and “metal path facility”, the two most common products Openreach provides to resellers, says Ofcom. They include 80% of repairs completed within two working days, 80% of new lines provided within 12 working days, and realistic estimates of when customers can expect the service they ordered. 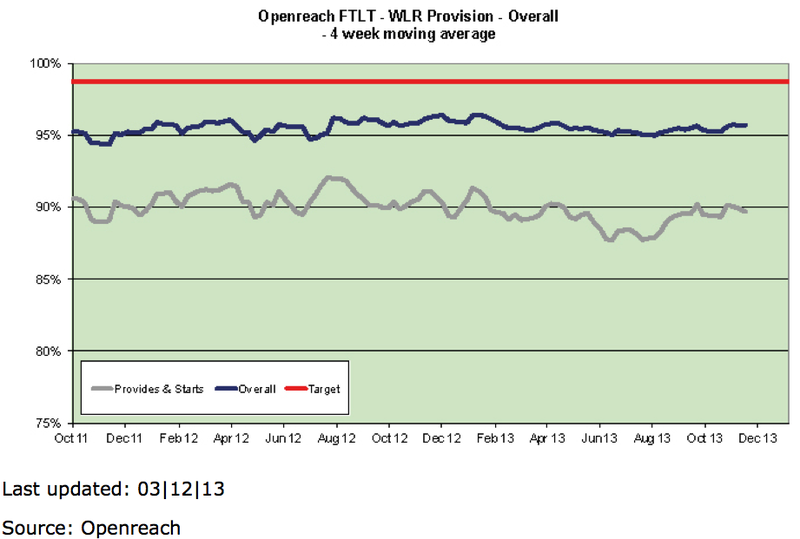 Failing to meet the new targets, averaged over 12 months, opens Openreach to Ofcom sanctions, including fines. However Ofcom proposes that BT can use “extreme weather” as an excuse for missing targets for up to three per cent of repairs and one per cent of new installations in a “typical” year. 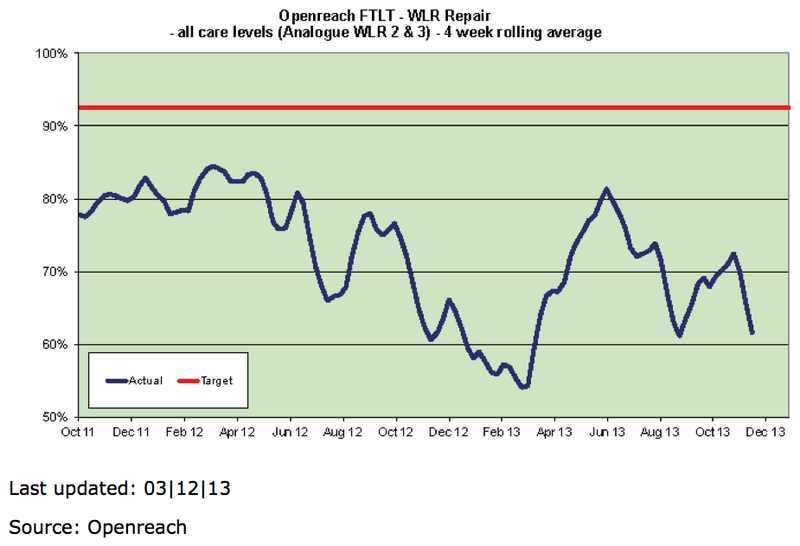 According to Ofcom, Openreach’s performance has since returned to pre-2012 levels. The proposals are part of a consultation relating to Ofcom’s fixed access market review, which closes on 13 February 2014. Ofcom will announce its decisions in spring 2014. Rural upgrade complete. Pic copyright RSPB. A reader has kindly sent BrokenTelephone the transcript of a recent radio interview with the CEO of British Towpaths. Listeners may perhaps have noticed that it is now 200 years from the introduction of railways. But maybe you weren’t aware of that. Maybe your mind was distracted by all the recent ballyhoo about Doctor Who and the anniversary of the Time Lord beginning his journey. And other journeys seem to have come full circle – the Monty Python team is reportedly going to revisit their sketches of past. So we set the Time Lord off to go visit 1813. Things seem to have gotten a bit confused onboard the Tardis with his future fragment of times passed. My Friday Boss today is someone who has been in the spotlight recently on account of the growing disquiet over plans for Steam Railways. He has certainly not been shy about voicing his view. He acts as the voice of our country’s slow movement arguing that investors willing to sink money into iron tracks have not thought the ideas through. During the debate for the Act of Parliament designed to make Steam Railway Planning possible he pointed out the vast investment already employing thousands in digging new and vital transport routes for the UK economy – and, of course, the headline writers have dubbed him Sir William OpenDitch – and he joins me now today. Morning John – delighted to be here and thanks so much for having me on. This is a debate that the country badly needs. Well I think we can understand why you might think that, Bill. Is it not the case that if Steam Railways went ahead your business might be, how can I put it, somewhat diminished? In a theoretical sense I guess you might be right, John. That of course depends on whether those crazy Steam Dreams actually have any real substance, but I’m not here to protect narrow interests – I speak for the nation when I say that we should stick to tried and tested infrastructure. But hang on Bill; are you saying that your canals really have enough capacity for the future? John, there’s a great deal of muddled thinking going on here and the great British public needs to be better informed. Just think about it for a few minutes – these Steam Railway people seem to think that you can make a great heavy iron machine and all its fuel and all the heavy wagons carry goods cheaper than what is essentially a box floating on water and pulled by a horse. Do you think we don’t have enough horses? I take your point, Bill, but what about speed – would the Steam Railway not deliver goods faster? Ah, the argument about speed – that’s another of those notions that needs better understanding. It’s really quite simple John. The amount of stuff that gets delivered depends very much on what is sent – there’s perhaps a small loss on the way – but unless anyone’s expecting a vast increase in what needs to be sent then surely delivering stuff faster makes no difference at all to the great British economy – it would just make more people idle. Most likely they’d need to rest anyway after rushing about like that. Well I’m glad you’ve asked me that. You see we at British Towpaths have a plan. It’s a plan that needs regulatory certainty and it’s far less disruptive and less costly than installing iron tracks for those Steam Railways. We are going to do four things – and John I’m delighted to say that the canal regulator Ofcan is with us on this. 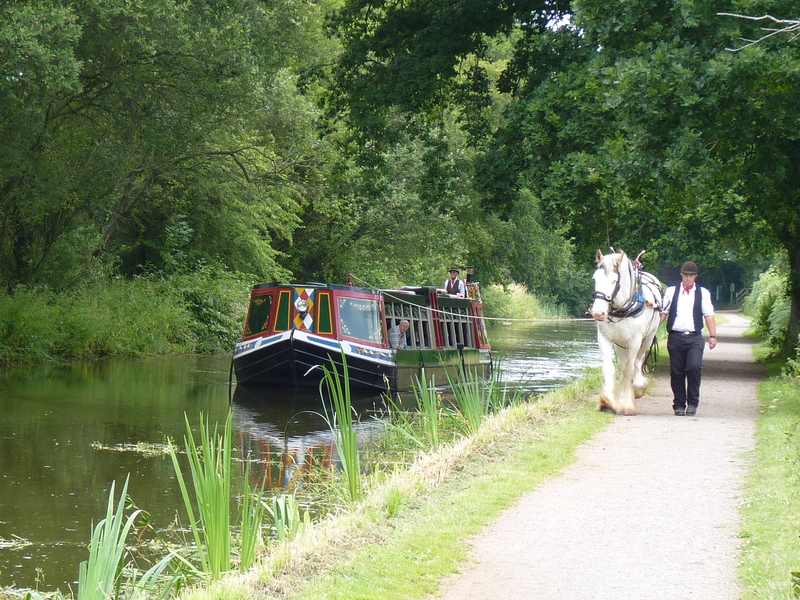 Firstly, starting soon, and this is the big news this morning, we are going to widen the towpaths – making more room for more horses so that if demand ever rises we will never have capacity problems. Hang on Bill, sorry to interrupt, but what about the narrow tunnels? Ah, I was coming to that. There are I agree some bottlenecks but our engineers have looked at those steam engines and come up with a far better idea. What we will do is sit them still – not have them moving – and use them with wheels and long wires on a continuous loop to pull the barges through a little quicker. That way, if there really does turn out to be more demand we will not have to rebuild the tunnels. Bill, sorry to interrupt again, but isn’t that going to be difficult to organise between one end of the tunnel and the other? A good question John, but one that our brilliant British Towpath engineers have anticipated. They have come up with a very clever system with a tight string between two cans so that the bargeman can speak to the Steam Engine operative at the other end of the tunnel. We’ve been testing it with Ofcan and it works really well. You say, Bill, that Ofcan are in agreement with your plans but are they not also worried about that lack of competition? Well, you might think that but working together we’ve come up with a plan – and it’s possible, John, because of the towpath widening scheme that we’ll be rolling out across the network over the next few years. I think I’d better explain the background. British Towpaths already sees itself as very different to the old Canal & Water company – you can see that we have a much more enlightened view on Towpaths – it’s in our name, our very being. So now we are going to push that concept further – and today, on your programme John, I am announcing that we are setting up British Towpaths Wholesale and it will be their job to allow other horses to pull barges on our towpaths – for a fee of course – but this, as I say, is in complete agreement with the regulator Ofcan who very much agree with me that the great British Economy needs to prosper by doing what it has always done brilliantly. We have a network that is the envy of the world. Well, thanks Bill, that’s all we have time for today, but I’m sure the entire Empire has much to thank your team at British Towpaths. Thanks John – and I’ll forgive you for describing me as William OpenDitch –but, if you must, I’d rather be described as Sir William SuperPath. Let’s not forget that British Towpaths is here today and British Towpaths will be here tomorrow. You can certainly rely on that. A happy festive season to you all. “Enemy” is far too strong a word in this context, but sometimes there are “hostilities” between the media and the spin doctors at BT. So BrokenTelephone read with considerable interest the job ad for a head spin doctor for internal communications & employee engagement at BT’s consumer division. It’s a nice little earner, which is no doubt why it attracted 112 replies on LinkedIn before the computer said “No.” And there are lots of recent and not so recent redundant journalists who could do with the “up to” £75,000 base (depending on experience) / £6,000 car allowance, pension, medical cover, 27.5 days leave, employee phone, broadband TV & BT Sport package / 15% bonus. BrokenTelephone will give a £10 Amazon voucher for the story that in the editor’s sole judgment, best shows BT “coping with ambiguity”. Simply use the comment box below to tell your story. Deadline is 5pm on 23 December 2013. If the winner decides to be anonymous, we can exchange details under separate cover. A now derelict BT microwave tower has been superceded by fibre in the countryside. Pic by Peter Barrington via Wikimedia. B4RN and Thurlestone have had their applications for funds to build fibre to the premises (FTTP) networks in remote rural areas approved in principle by BDUK, the government’s broadband delivery agency. They are expected to receive their confirmation letters today. The only thing stopping the projects now is their local county councils. BDUK’s approval is expected to increase pressure on Lancashire in B4RN’s case, and Devon and Somerset in Thurlestone’s case to remove the proposed coverage area post codes from their BT contracts. BT effectively has a veto on such deals. BDUK guidance says it may choose to assess the impact of removals on its existing plans before claiming compensation for the smaller contract or proposing a new deal that includes some or all of the altnets’ areas. The Thurlestone community is to meet on Tuesday evening to compare two network proposals, but Armitage says CD&S and BT are refusing to attend. CD&S and BT plan to hold a separate public meeting on 22 January 2014, at which BT Next Generation Network boss Bill Murphy and Devon Council leader John Hart may speak. Thurlestone plans to use money from the DEFRA-controlled £20m Rural Community Broadband Fund (RCBF) to back bank loans plus Enterprise Investment Scheme equity plus private equity to fund a FTTP network to 1,300 premises across Thurlestone and South Huish (Hope Cove) parishes. This could be extended to Salcombe and the rest of the South Hams over time, Armitage says. Christine Conder, who has been the public face of the B4RN project, says she hasn’t seen confirmation of BDUK’s approval. That would more than double B4RN’s original footprint of around 1400 homes/businesses to over 3,000. Funded originally along the same lines as Thurleston, B4RN has been waiting years for RCBF money to fund the bigger project. 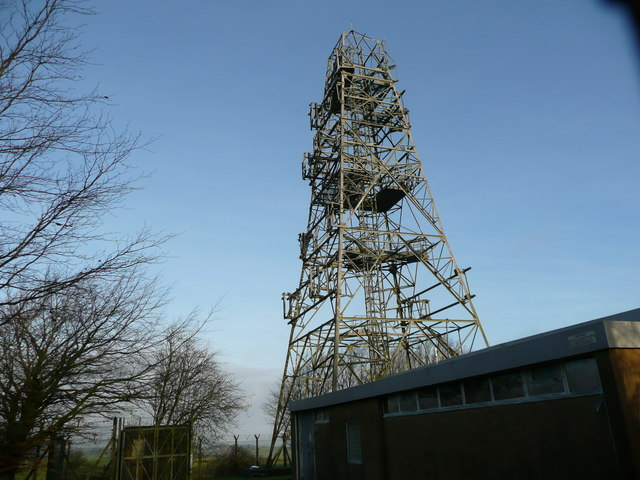 Well-connected blogger Philip Virgo reported correspondence from B4RN’s CEO Barry Forde that suggested Lancashire had reneged on a deal to exclude B4RN’s coverage area from its £130m next generation broadband deal with BT. Project director Andrew Halliwell refused to speak to BrokenTelephone about the alleged agreement, or a controversial fleet management deal that BT has with Lancashire County Council via a joint venture, which attracted a police investigation. If Thurleston and B4RN get their money, they will join Rothbury in Northumberland and Fell End in Cumbria, both of which have contracted with BT for their networks, as the only RCBF beneficiaries so far. Others are trying to join in. There are reports of more than 50 RCBF applications, nearly all of which have been turned down. One of the survivors, the Northmoor, Moreton and Bablockhythe Community Broadband Project in Oxfordshire, has just issued a state aid consultation on its plans to deliver 100% coverage at >24Mbps by 2015 with RCBF backing. “We have some 520 homes and businesses in the project area, which is now descoped from the county plan by Oxfordshire County Council,” says spokesman Graham Shelton. Shelton’s group has worked with West Oxfordshire District Council to manage the grant and the various steps to procurement and delivery. “(Councillors) have been, and are, hugely supportive. Ours is a very rural district with 25% home working or businesses run from home, so this initiative is highly significant to support our community,” he says. Current broadband speeds in the Northmoor coverage area vary but are often below 1Mbps when homes are far from a street cabinet, he adds. Shelton estimates that state aid intensity to be no more than 50%. That is in stark contrast to some BT contracts where the state contributes more than two-thirds of the costs, and may run above 90% in some cases and deliver less than the altnets promise, according to Malcolm Corbett, CEO of the Independent Network Cooperative Association (INCA). UK SFBB penetration to outstrip Japan by 2018. Really? It took a single question to unstitch a carefully woven fabric that pictures the UK as a global leader in high speed broadband. Three reports have came out in the past couple of weeks that appear to justify the government’s broadband policy. One, on the domestic demand for broadband was from the Communications Chambers for the Broadband Stakeholders’ Group. Another, from SQW, reported on the economic impact of broadband to the department of culture, media and sport (DCMS), which is responsible for the UK’s telecommunications policy and implementation. BT earlier commissioned market researcher Analysys Mason to write a benchmark report comparing the UK’s roll-out to competitor nations. The reports are well worth reading to understand the assumptions and methodologies that led to the conclusions drawn and pictures painted. Each in its own way puts the rosiest possible gloss on the numbers. SQW found a 20 to 1 ROI in terms of gross value added by 2024. BSG said the average home will need only 19Mbps by 2023, and the top 1% of homes will need only 39Mbps tops. 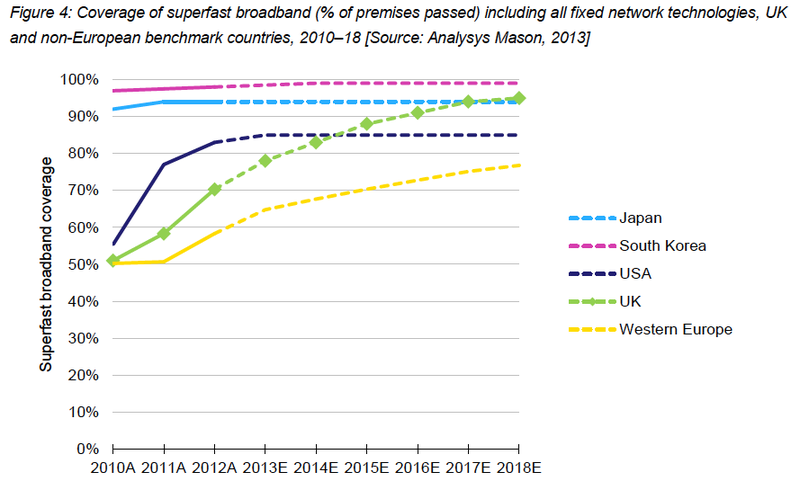 Analysys Mason partner Matt Yardley told a Westminster eForum audience in London yesterday that the UK coverage of high speed broadband would slightly exceed Japan’s by 2018 (see graph). It all looked so responsible as to the use of taxpayers’ money. Only the cynical might think that the coruscating National Audit Office report on the value for money that taxpayers can expect from the £1.2bn (or is it £1.4bn?) 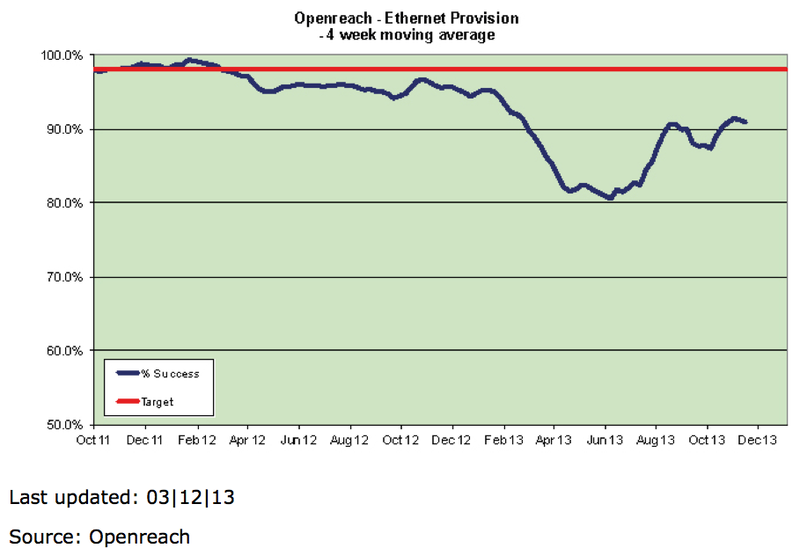 they are giving BT has anything to do with the sudden improvement in our insights into broadband a la UK. According to an Arthur D Little presentation to the FTTH Council Europe, in December 2012, fibre to the home or basement was available to 90% of Japanese homes, and 42.5% were connected via fibre. According to OECD figures for September that year, the average advertised broadband speed in Japan was 95Mbps.